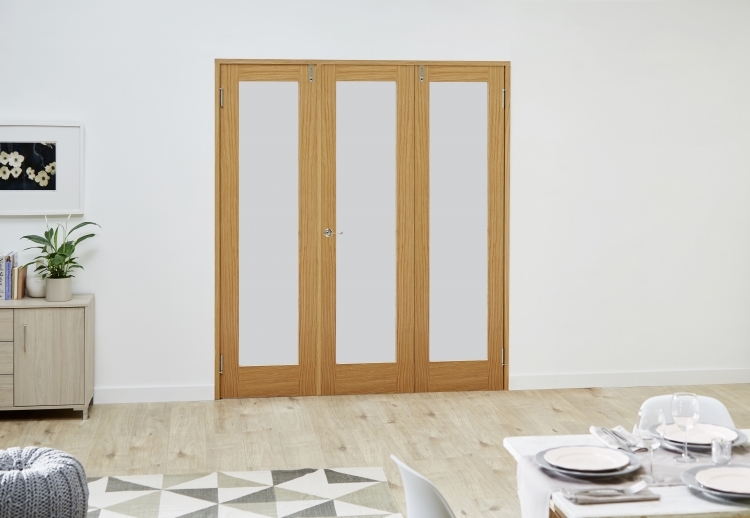 If you’re after a classic and simple design that will suit your home whatever the style, the glazed oak shaker frenchfold room divider door is a great option for you. Internal French doors allow you to brighten up your home by increasing light flow between rooms and this shaker design is no exception. The simplicity of the design allows this versatile door blend seamlessly with your home decor, whatever your style. The oak frame is warm and tactile, creating a natural feel that many people desire for their homes. You can choose to finish this door by complementing the natural appearance with a subtle stain or varnish, or colour match to other items in your home. Please refer to our storage and decorating recommendations before installing the doors. All doors MUST be decorated before installation, and we’d recommend a joiner is used for installation. The Shaker frenchfold room divider range has an engineered core, ideal for thermal efficiency, strength, durability and value for money.